Training for People of all Abilities and Ages! Green Machine offers training and education for a wide range of individuals, we offer apprenticeships in Business and Administration and IT Computer Technician roles, we also offer Work Experience, Day Visits and other types of work placements. For more information please be in touch. Green Machine offers a nationwide IT recycling service, for companies across the UK. We repair, reuse, and recycle the kit we collect putting it to good use, either by funding our training academy or donating to charities and people in need. 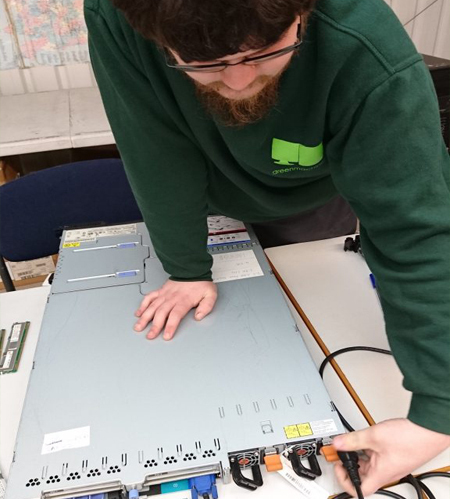 The kit collected is repaired in our IT Academy, this results in the ability to offer eco-friendly computer equipment at low cost to anyone in need. From donations to schools or charities, to low cost solutions to small businesses. We also offer IT repairs and IT support to local SME’s, schools, charities and individuals alike. Our ever-growing customer includes youth clubs, schools, charities, farms, accountants and dentists to UK Atomic Energy, Vodafone and Land Securities. Every company and person we do business with has their carbon footprint reduced, as we reuse everything we possibly can. With the growth of the company we are now able to offer disadvantaged / disengaged adults a chance to have a career in IT, with the foundations of an IT training academy, this is in its infancy and has been running for just over a year. We have five apprentices with various levels of skill and ability. Everything we use is recycled where it can be, from desks and furniture, the pens and pencils. The whiteboards, cables, doors, even the kitchen sink…. all recycled, the window in our office is made from an old recycled glass server cabinet and of course all our IT! In order to process the equipment we give young trainees an opportunity to learn about IT by working on the equipment under expert supervision. These trainees generally have an interest in IT from a gaming background and many of them go on to gain a formal qualification in IT through an accredited IT apprenticeship. Some of our trainees come from disadvantaged backgrounds and with learning difficulties where they have struggled to gain formal qualifications or hold down full time employment. We teach them about IT equipment, how it works and how to disassemble it. We then show them how to recognize the reusable items or parts and how to safely recycle them. Our aim is to improve their working skills and professional interaction skills as well as taking them on a journey to formal qualifications.